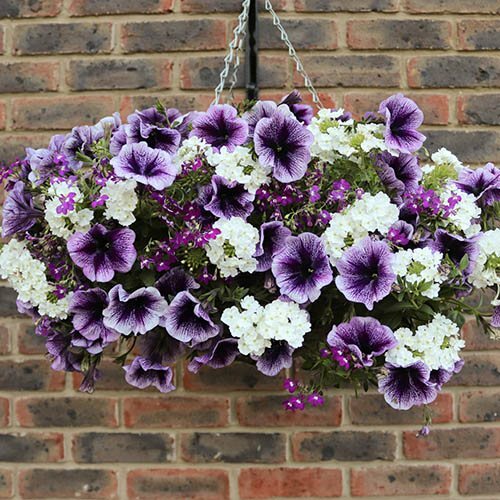 The easy way to fabulous hanging baskets. Quick and easy - the perfect solution if you’re late getting your baskets ready, or don't know where to start. We’ve done all the work for you – just hang them up, water them and watch them romp away! Guaranteed to give you fabulous colour all summer. The baskets can be used year after year. 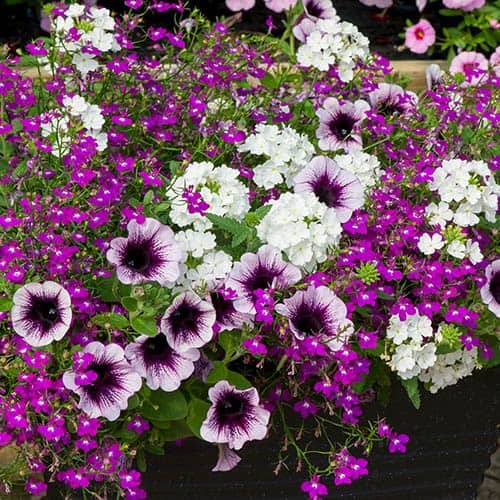 'Treasure Chest' plants are supplied ready planted into a pair of 27cm durable, purple plastic hanging baskets. 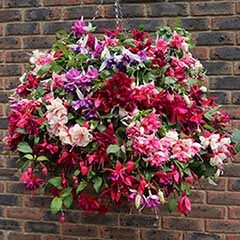 Our pre-planted baskets are guaranteed to give you fabulous results, we've done all the work for you - just hang them up, water them and let them do their thing. 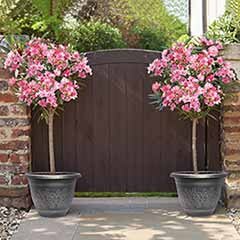 Quick and easy, this is the perfect solution for gardeners who want perfect displays but don't know where to start, or for those who are behind with their plans. 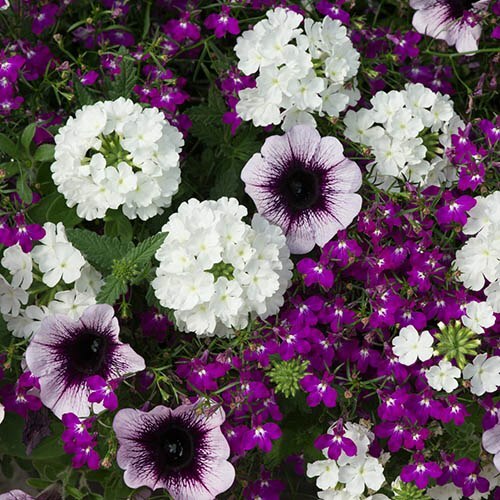 ‘Treasure Chest’ is a cool and calming blend of trailing lobelia, trailing verbena and surfinia petunia, guaranteed to grow happily together. 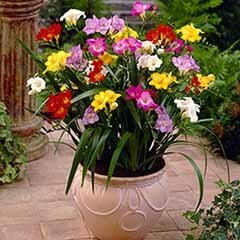 Pre-planted in a pair of purple-coloured baskets, you’ll be rewarded with gorgeous colour through the summer. 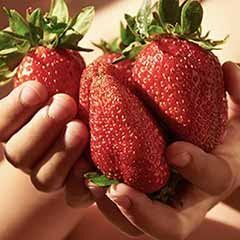 Our ready-made baskets are the end result of trials to find the perfect partners to grow together and perform consistently. 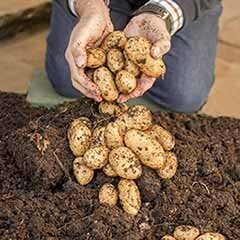 Perfectly matched, to give you outstanding results in as little as 6 weeks - plus you'll have the baskets to use again next year! Our hanging baskets come straight to you, ready planted with our top quality, UK-grown plants go with no work required! 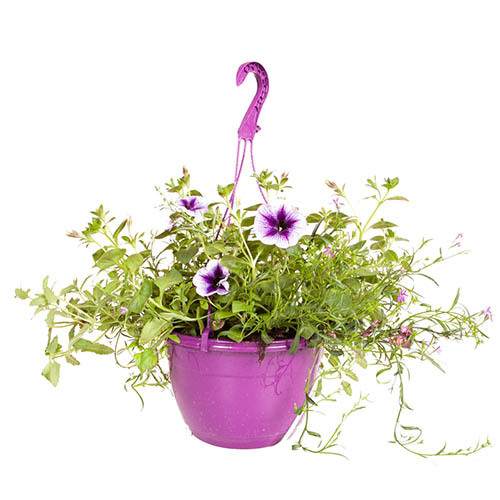 Supplied ready planted with 'Treasure Chest Mix' into a pair of 27cm durable purple plastic hanging baskets. 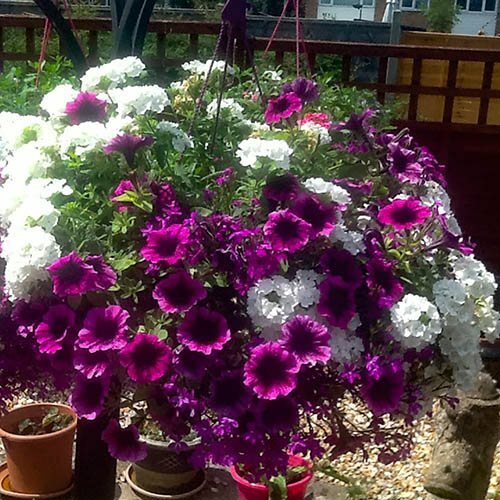 Regular maintenance and watering is essential to grow fabulous baskets that last the whole season. 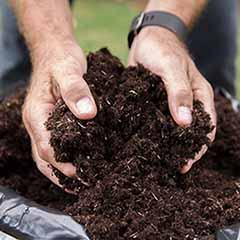 Deadhead and trim your plants regularly to maintain shape and encourage new flowers. 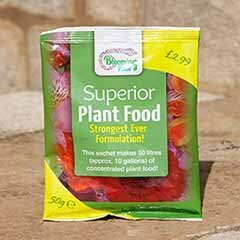 From April to September, apply a general purpose liquid fertiliser once a week. Love my hanging baskets . They were very full and colourful. Much better than my local garden centre. They will definitely receive further orders from me. The only down side was the length of time it took to get from the delivery company to me. Lovely planters, but because of the reason above by the time I received them some of the plants had dead flowers on. They have since recovered, I unpacked them left them in the greenhouse standing in a dish of water. They arrived together both in perfect condition, I watered them hung them and up, they are looking better each day very pleased beautiful colours and healthy plants. Great adverts, just there is a distinct variation in the advert and the reality. 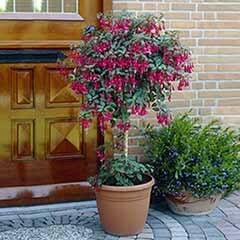 Up to a point this is understandable as to have the plants arrive fully in bloom as advertised would double the price and shorten their flowering time. 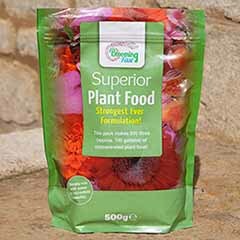 The packaging was designed to carry the product and should give good protection for the plants, however it is not designed for the rough handling by the couriers. Either change the packaging or change the courier, both of which will add to the price and reduce sales. Not an easy fix. Garden Bargains were really good about the poor quality and replaced immediately. The planters were good and exactly as shown in the adverts, the plants however looked bedraggled, bruised and uprooted due to poor handling, the box was wet where the planters had been tipped up during transport and quite a bit of the soil and water had tipped out. Easy fix is to use a plastic tube (a long bag) to pull up from the base to the tips and tie it in a knot. 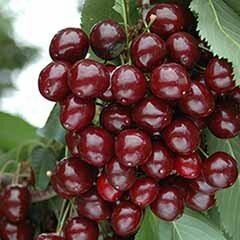 This would also protect the plants a lot more when being poorly handled in transit. Dead mouldy plants in both hanging baskets no flowers could not retrieve despite care they were beyond help very very disappointed. Replacement hanging baskets had all the dead flowers chopped off so all that's arrived Was stalks and leaves. The nursery that supplies needs looking out to send plants out in that state is appalling. nursery that supplies needs looking out to send plants out in that state is appalling.